A big reason that guitarists stop learning to read notes on guitar and in their music is because of this confusion, but let’s look at this logically. The voicings of the note in the second bar are probably going to be too high up on the neck to be of much use in a ‘normal’ playing situation, so let’s discount these. The open string has a very specific tone that can sound out of place or ‘unblended’ in anything other than classical music or acoustic chords. The voicing on the 4th string is possible, but it’s unlikely unless you’re already playing in that position on the neck. The two most likely voicings of the note E occur on the 2nd and 3rd strings. They’re also fairly close to each other physically and not too distant in terms of tone. In fact it is normally true that the ‘best’ area in which to read on the guitar lies between the 3rd and 10th frets. This is of course completely subjective, but most professional musicians seem to agree that the majority of music you will come across will normally lie comfortably in this area. With the exception of rock guitar solos I would definitely say this has been my experience of professional reading, and in terms of actual usefulness having knowledge of this range of the fretboard is definitely a huge priority. No disrespect to rock guitar solos; they’re extremely useful but often not notated in a live environment. While written pitch and rhythmic notation are fairly easy to learn, most guitarists seem to struggle with the application of this information to their own instrument. While the notes on the keyboard simply ascend from left to right, the guitar is less simple; to change the pitch of a note we can either move up one string or change strings entirely. This ‘three dimensional’ aspect to the location of our notes can unfortunately stop players in their tracks. However, if we remember that most music is formed from uncomplicated scales which can easily be shifted around the neck we start to realise that the guitar neck is a little less daunting than we first imagined. The first step in learning to read music and learning to read notes on guitar will always be the recognition of a note’s pitch on paper and its transfer to the instrument we are playing. With this essential understanding we can start to logically approach the task of reading music on guitar. When we read a word on paper, our brain is recognising a pattern and attaching meaning to it. This is the process you began learning when you were a few years old. To be fluent sight readers and learn to read notes on guitar we need to first of all recognise the dots and lines of music notation as easily as you are reading these words now. We simply need to attach meaning to new patterns. Music notation works by giving an almost graphical view of pitch against time. As you read from left to right, you could consider this as time moving forward as a constant pace (governed by tempo). The height of the note on the stave (the five horizontal lines) tells us its pitch. Each line and space is a set, consistent note which will always sound at the same pitch. Here are the notes from the C Major scale with their letter names written in below. The first thing you will notice is that the notes in the spaces spell out the word ‘FACE’. This is very handy when we are learning to recognise pitches instantly. There are plenty of phrases you can use to remember these notes so try coming up with your own. If you refer back to the scale of C major you will see that we haven’t covered every note yet but don’t worry. It’s best to break things up into small steps. Try reading through the following example (without your guitar) to help develop your note recognition skills. Keep referring to the names previously written if you struggle to remember them. If you feel confident move on to read notes on guitar in the next lines. There is no need to go too far at this stage. When you’re gaining confidence, set a metronome to 40 beats per minute and say the notes out loud in time with the click. You should be reading two notes for every click of the metronome. Over the period of a few days gradually increase the metronome speed in increments of 5 beats per minute (bpm) to 60 or above. All of this should occur without your instrument in your hands. We’re just trying to memorise the meaning of each dot. You could imagine you’re an actor in a play and you’re trying to memorise your words without the distraction of actually having to perform them at the same time. You can now begin to read notes on guitar all the way through these two pages. As this becomes easier, remember to switch things around by using the four points above to create new material. Set the metronome back to 40bpm and work in the same way to incrementally increase your note recognition. 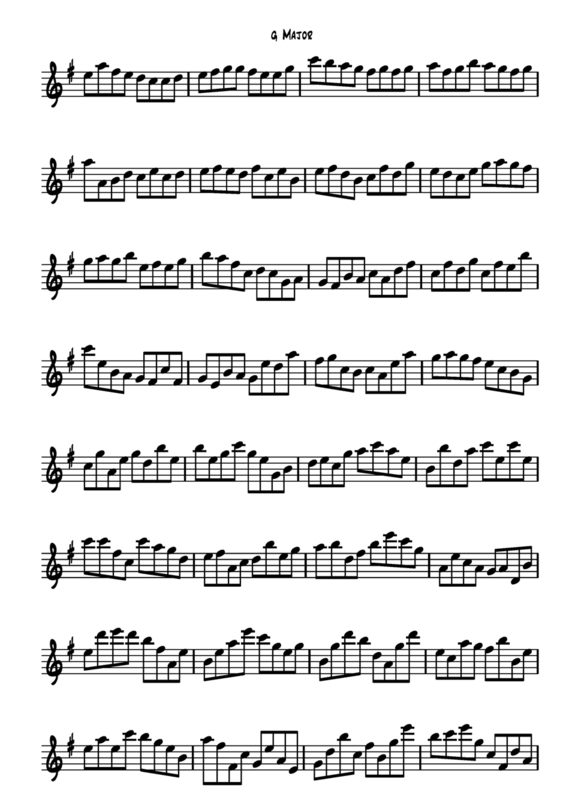 Most, but not all of the notes on the stave have an extra pitch contained between them. For example the note C# (C sharp) lies between C and D. The note C# is referred to as a chromatic note. As you can see, the note C is notated on the stave with a # (sharp) sign before it. I was recently asked in a lesson, ‘What does hashtag C mean?’ I wasn’t happy. For our purposes, the note C# is the same as the note Db (D flat). The notes C# and Db are referred to as enharmonic which is a complex way to say that two notes can have the same name. Each pair of two notes sounds identical. Sharps and flats occur regularly in music and are used to alter some of the notes in a melody, or todesignate which key we are playing in. 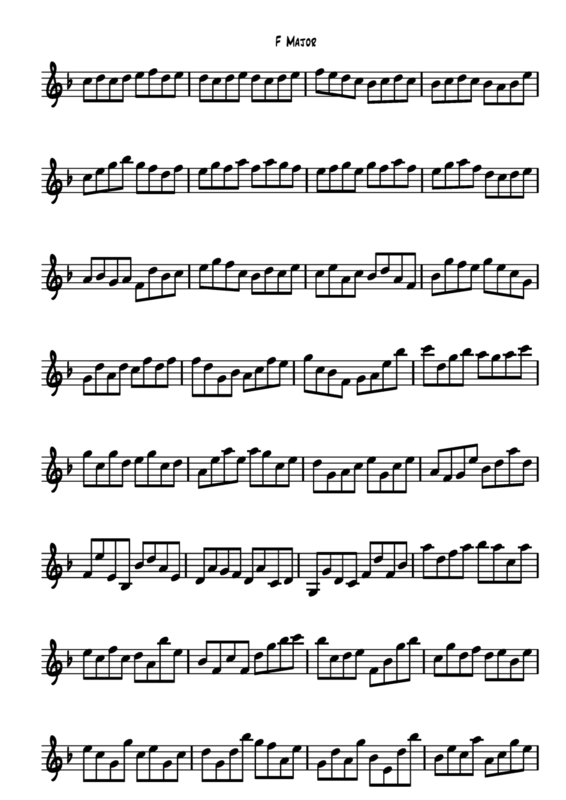 Look at page 51; You can see the sharps occurring frequently throughout the example. When we come across sharps or flats we simply play the altered note instead of the original. Instead of saying ‘F’ in the second bar, say ‘F Sharp’. This is the note you would play on your instrument. In the first bar you would say and play the note Bb instead of the note B. These two examples show how we treat sharps and flats when they crop up in the score occasionally. However, another way sharps and flats are used is to define the musical key of the music. This isn’t a theory book so this explanation will be brief, but by using certain, simple combinations of sharps or flats at the beginning of the piece of music, we can indicate what key the music is in. 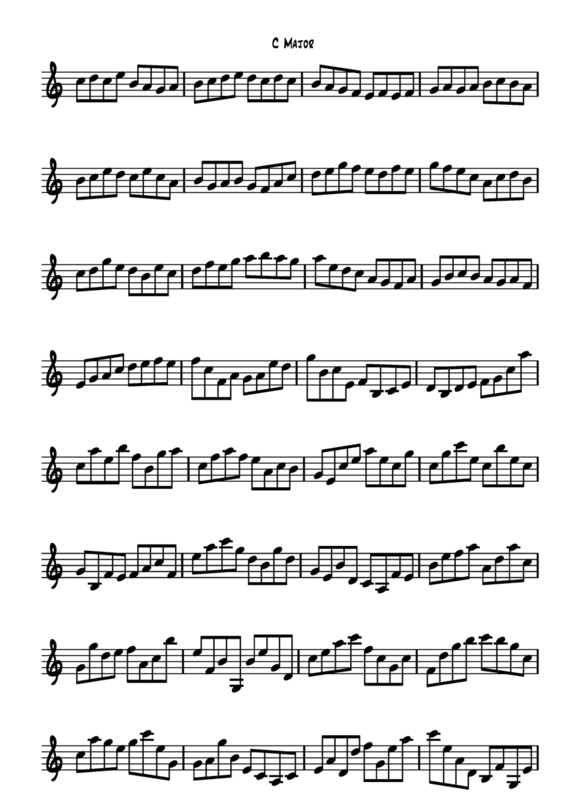 For example, by writing an F# at the beginning of the music we have defined the key as G major. For more information on how sharps and flats define key signatures, check out The Practical Guide to Modern Music Theory. Or E minor, but this isn’t important right now. What this means for us as sight readers is that every time we see an F in the music, we play an F# instead. This F# is not only played on the specific line it is written on, it affects every F in the piece of music unless we’re told otherwise. This is the key signature for the key of F major. It is always up to us as readers to take notice of the sharps or flats in the key signature, and remember to apply them to every note they affect.